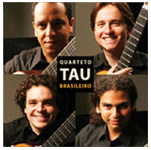 Brazilian guitar quartet with two CDs released, "Brasileiro" in 2007 and "Cordas Brasileiras" in 2011 by the label Delira Música with production by Paulo Bellinati and texts by Egberto Gismonti. Performs recitals, concerts with orchestra and master classes in the main Brazilian capitals, cities in Latin America and the United States. He participated in the Sesc International Guitar Festival, the Villa Lobos Festival and the International Music Festival in Pará. Outside, the awards ceremony was held at the IV Guitar Contest and Festival of Havana, at the Guitar Festival in Montevideo, and in the United States participation in the Guitarists of World series, Friends of Music, The American Guitar Society Concerts Series and Forth Worth Classical Guitar Society. He was a finalist of the Sharp Music Prize (1996) and received the Carlos Gomes Prize from the Culture Secretariat of the State of São Paulo, for the "Antique" CD. He recorded this and four other CDs, among them Forrobodó, released in Europe by the seal ECM. Master in Music from the Unesp Institute of Arts, awarded in various competitions, such as the Mozarteum Competition, Souza Lima Contest and Nabor Pires Camargo Prize. He is a guitar teacher at the FITO Music School, at EMESP Tom Jobim and at the Villa-Lobos Conservatory, as well as artistic director of the Musicalis Guitar Competition. Alongside his father, Giacomo Bartoloni is part of Duo Bartoloni, who recorded the CD "5 Brazilian composers for 2 violinists", with performances in the main concert series of the country. In France, he performed several recitals and recorded the CD "Romantique" with the Franco-Brazilian Duo. He made world premieres of works for solo guitar by composers Achille Picchi and Paulo de Tarso Salles, shown on the "Violão" program of Radio Cultura de São Paulo. Master in Music by Unesp and Bachelor in Guitar by USP, he is part of the TAU Quartet of guitars, a group with which he recorded the CD "Brasileiro" . He has held several specialization courses in Brazil and abroad, especially the 24th Brasília Festival and the 34th Campos do Jordão Winter Festival. It was the winner of the 1st National Contest Dilermando Reis and the Souza Lima Contest, category Chamber Music. He took part in the 1st Brazil-France Exchange, winning a scholarship at the École de Musique du Tregor in Lannion. There, it realized concerts in several French cities. He is currently the pedagogical director of Projeto Guri, from the Secretary of Culture of the State of São Paulo. At age 15, he won the second prize at the Councours International de Guitarre de Trédrez-Locquémeau in Brittany, France. Bacharel in erudite guitar by FASM presents himself as soloist and in chamber groups in Brazil and abroad. He recorded "Portraits of Radamés" with Paulo Porto Alegre, Edelton Gloeden and Rosana Civile, as well as "... Universos Sonoros para Violão e Tape ..." - guitar and electronic, both sponsored by Petrobrás. He is also a member of the Saraiva-Murray duo with which he has recently performed concerts in Europe (France, England, Portugal and Greece ).